Merry Christmas, from Szeged! We celebrated Christmas today as we studied the Bible story of the birth of Jesus from Luke 2. In worship this morning we sang Christmas hymns and heard testimonies from Kelly and Shannon. After lunch we decorated the church with lights, a Christmas tree, stockings for everyone, and other wall hangings. 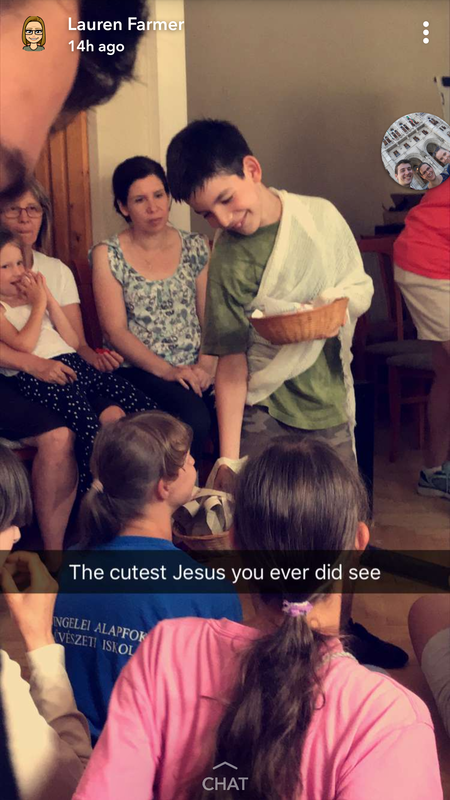 Our Christmas pageant had parts for everyone… Mary, Joseph, the donkey, Gabriel, shepherds and sheep, barn animals, angels, wisemen, camels, King Herod, the star, and of course, baby Jesus. The story was told in two languages with characters speaking their parts in English. We sang more Christmas songs and ended with a reading of John 1:1-14. It was a fantastic day of fun and worship. After the pageant we celebrated English camp by handing out certificates for all participants and helpers. Then we exchanged thank yous and gifts including stockings. Although pizza is not a traditional Christmas food (haha) it was the easiest for our crowd so we feasted. We did have traditional Hungarian treats for dessert! This evening we enjoyed walking with our hosts around town and took our time savoring the last few hours together. 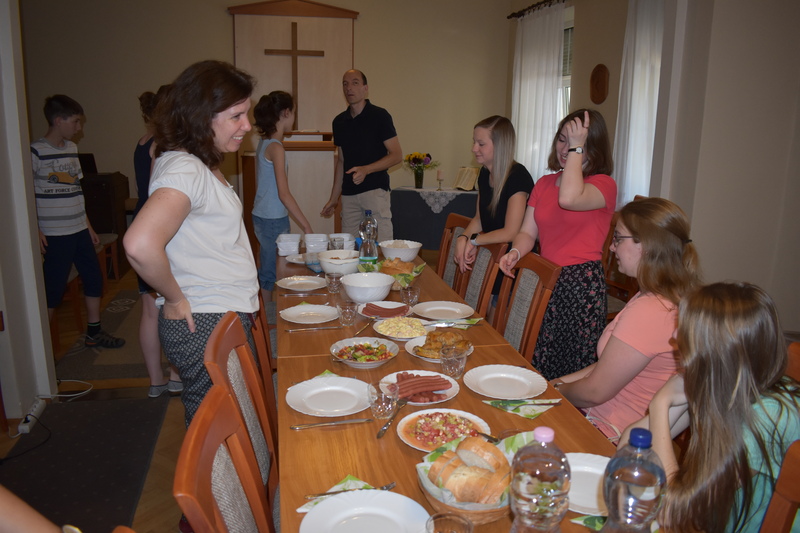 The week has been a wonderful time of building our family connection with these beautiful people of Szeged UMC. I’ve been blessed to have been a part of the adventure. Thanks so much to all our church family back home for making this trip possible. You have helped to bless our friends here. They are humble, gracious, and thankful. Thanks for all your prayers as well. See you all back home soon! The fun and learning continued on Day 3 of English camp. Lauren shared her testimony in worship today and our singing has taken on coordinating motions and increased in volume! Everyone is getting quite comfortable with one another. The lesson today was about Jesus feeding the multitude. We enjoyed another skit and our Jesus did in fact multiply the fish being handed out. It was a miracle! The afternoon was filled with preparations for our Christmas celebration tomorrow. We made ornaments and decorated gingerbread cookies. The kids think it is nuts to celebrate Christmas in August… it is a first for everyone. 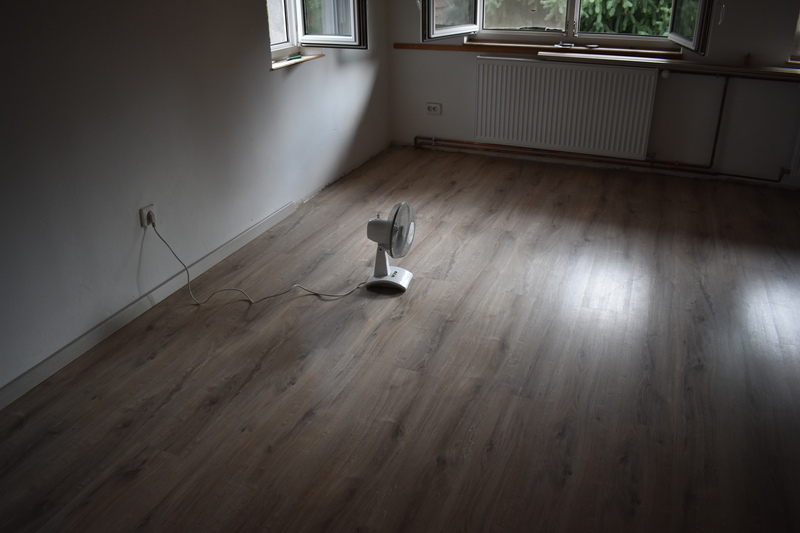 Meanwhile, the guys finished installing the subflooring for the loft. Yay! We are all excited to see what tomorrow will bring…. a Christmas pageant at least. Stay tuned. Peace to you. Merry Christmas Eve! Today, Wednesday, was the second day of English Camp. 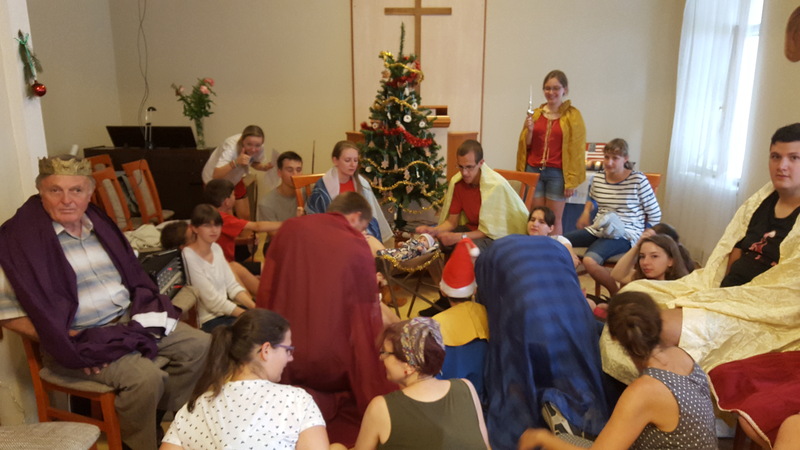 Once again we began our day with worship, singing songs in both Hungarian and English, reading a Psalm, and today hearing a testimony from Michaela. The themed song for the day was “Oceans” because we studied the story of Jesus walking on the water. After morning lessons in our groups we even acted out the story… twice! Characters included Jesus, Peter, the disciples, the boat, the ocean, and the wind! Everyone had a part! The afternoon was filled with games, crafts, and lots of laughter. This evening the church prepared a feast for us with home-cooked food and candlelight! I could get used to this! We are all thinking ahead to our big day on Friday. Lots of surprises and good times ahead. Hugs to all back home! 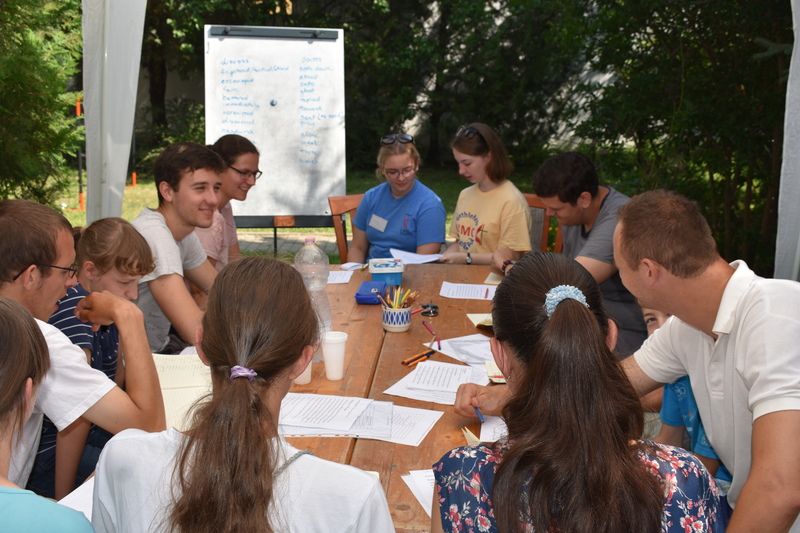 Tuesday was our first day of English camp and it went very well. There were about 20 Hungarians with us, some were campers and some were helpers. First thing in the morning we enjoyed worship together as a large group. Worship included singing, reading a psalm, hearing a testimony, and prayer. Then we split the group into two classes and had the “sister acts” covering each class, meaning Kelly and Shannon led one class while Michaela and Lauren led the other. 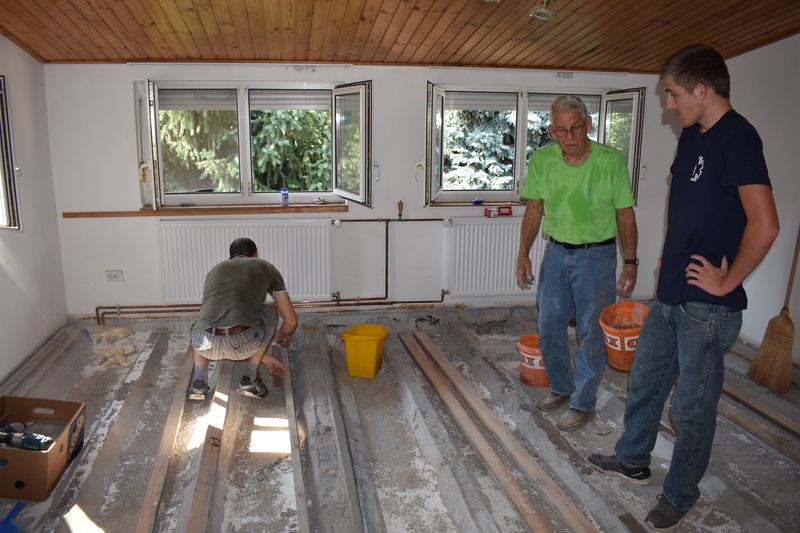 Susan was a floating helper with the English camp, while Chuck and Cameron worked on construction in the loft. After lessons and construction in the morning, we walked into the city center to eat as a large group at the cafeteria. Then we marched our way back to the church! It is quite a production for such a large group but gives us the opportunity to enjoy being outside walking and talking with our Hungarian friends. The afternoon was a time for crafting as we decorated journals, and also enjoyed some soccer together. Each day this week we will be studying a different Bible story. Today was the story of Noah. 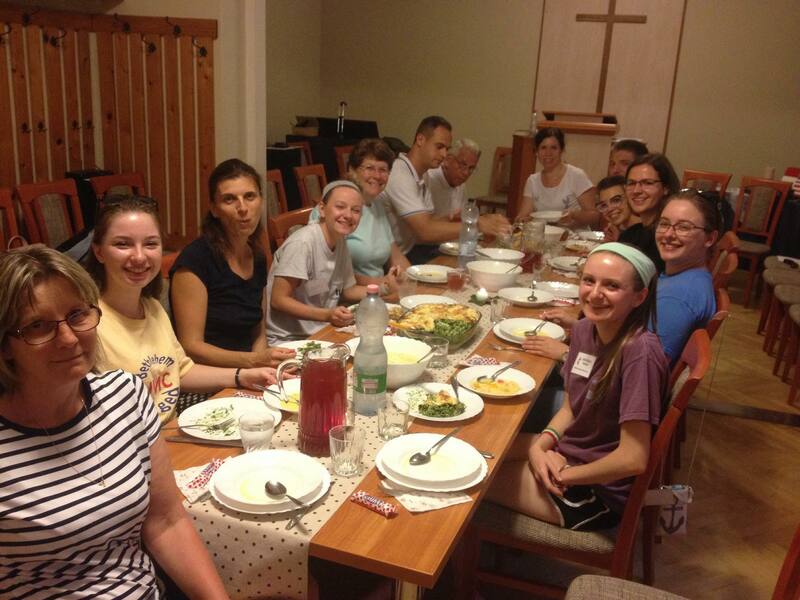 Thanks for your continued prayers for our ministry here with our Hungarian brothers and sisters. What a warm and welcoming group of people! It is such a joy to be here. 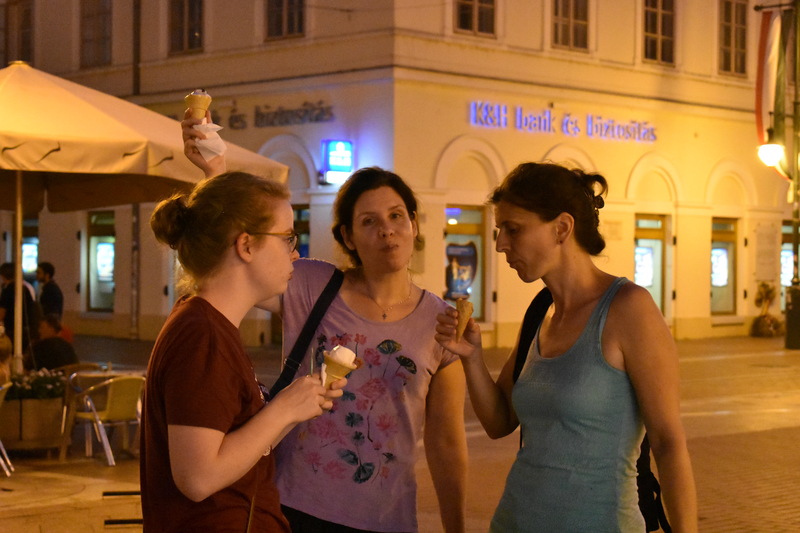 We finished our first full day here in Szeged and we are having a wonderful time with our Hungarian family. 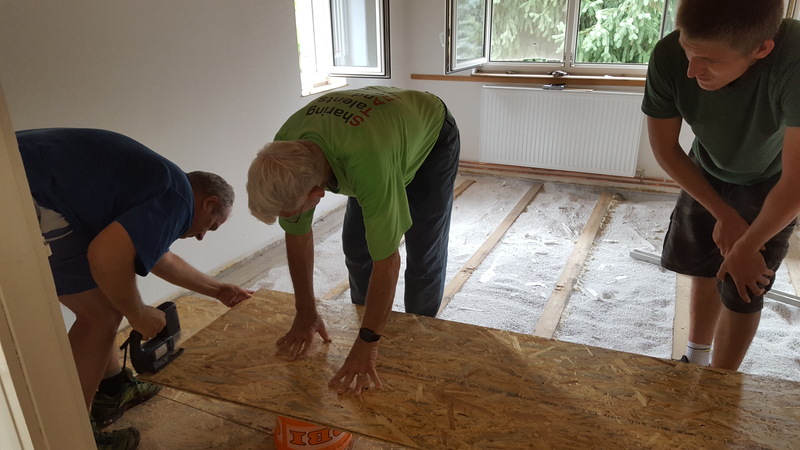 This morning the men began working on their construction job in the loft as they purchased supplies for the job and began preparing the area to lay a new floor. The ladies gathered and also went to purchase supplies for the English camp which will begin on Tuesday. 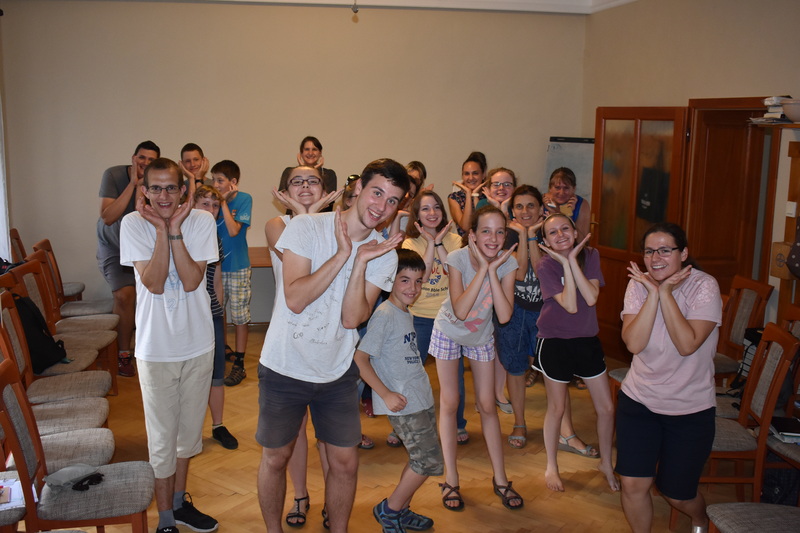 After lunch we did some planning and final preparations with our Hungarian partners for the camp including lessons, activities, and crafts. In the evening we enjoyed a prayer service with the church congregation, dinner, and a walk about the city. Tomorrow will be a big day as we welcome members of the church and community to English camp! Thanks for all the prayers coming from Virginia for this outreach ministry and mission. 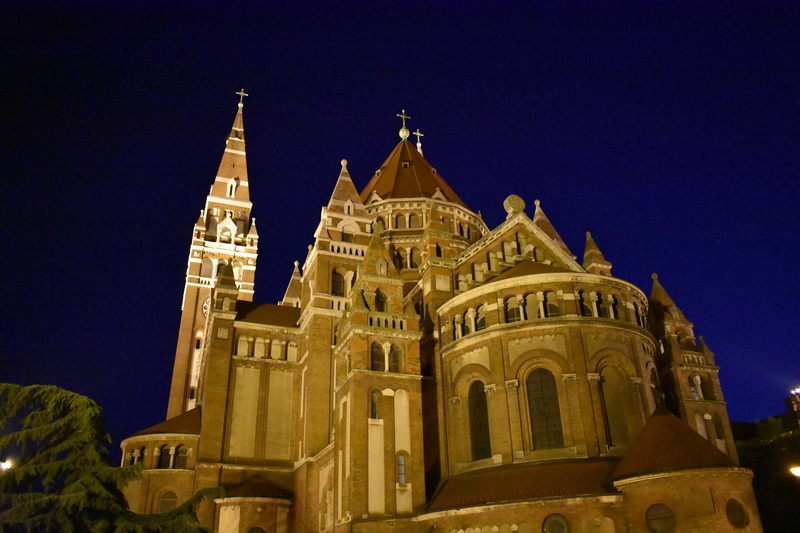 In September 2011, Bethlehem entered into a covenant agreement with Szeged UMC in Hungary to provide financial support and a seminary scholarship. In addition, the churches share prayer requests and have visited both here and there. 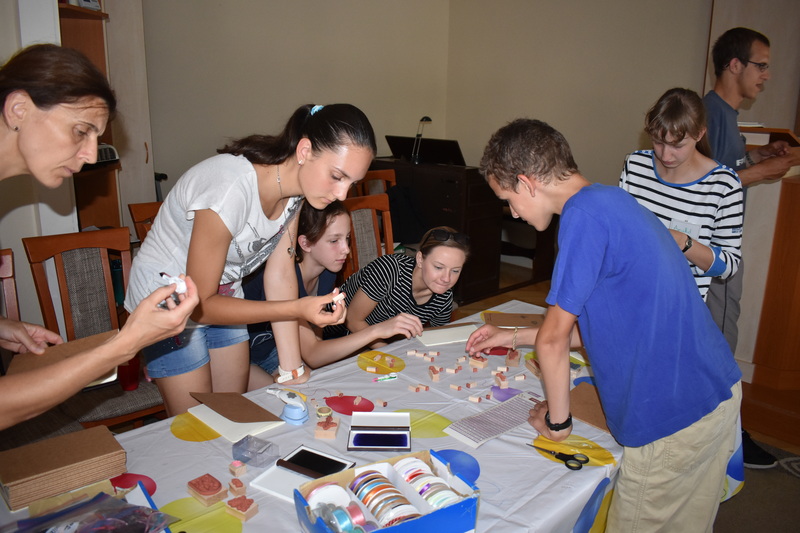 In 2013, members of Bethlehem traveled to Szeged to help with their summer vacation Bible school program. 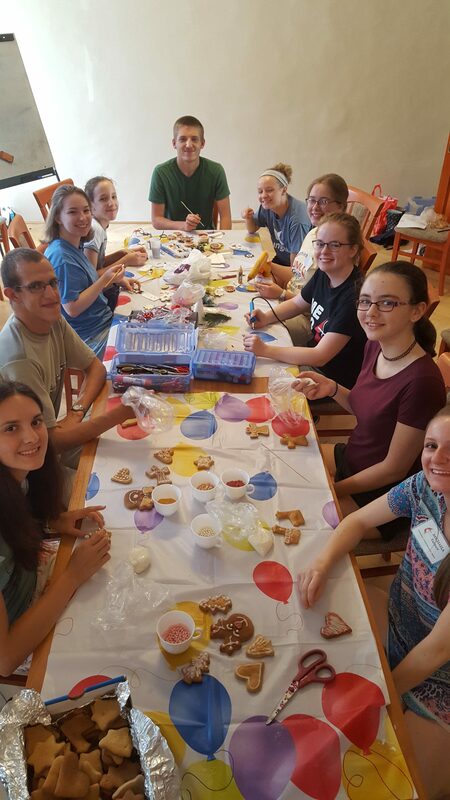 Shortly thereafter, a team from Szeged visited Bethlehem for our VBS. 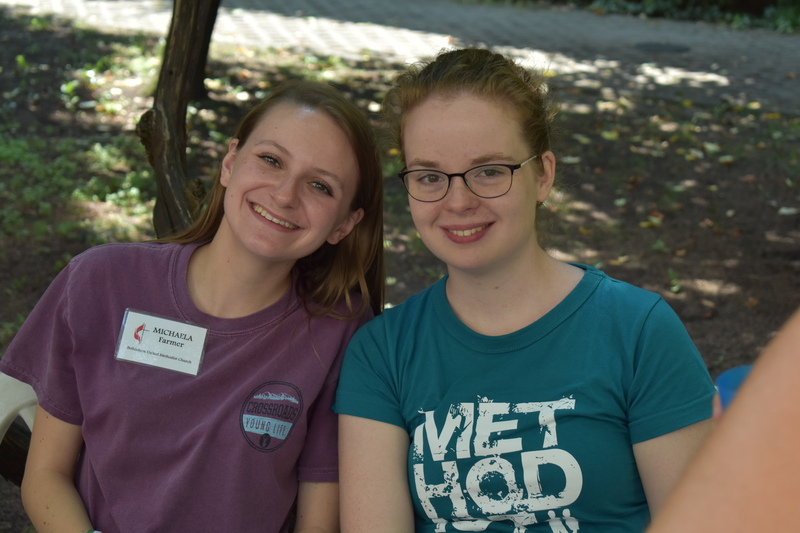 In 2015 several of our youth traveled to Hungary resulting in lasting friendships fueled by today’s social media. 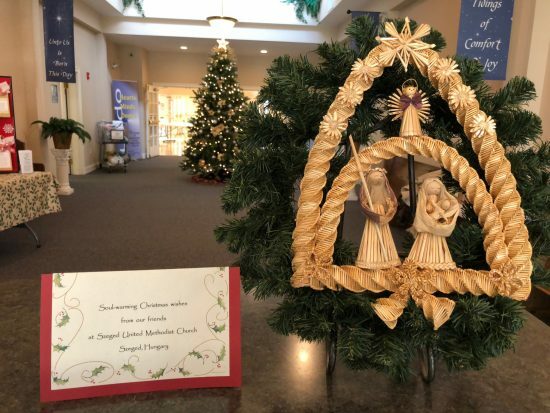 Our friends from Szeged surprised us with this beautiful 2017 Christmas arrangement. The BUMC International Missions team is in the planning stage for a trip to Szeged UMC in the summer of 2018.